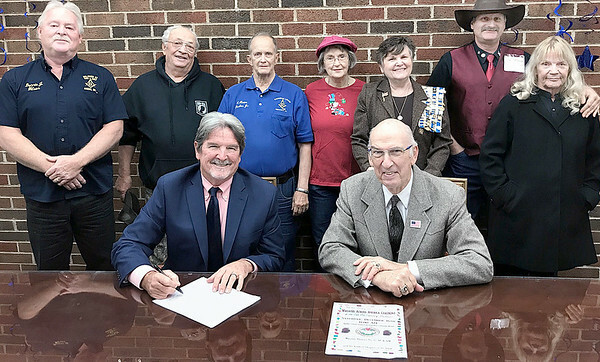 McAlester Mayor John Browne signed a proclamation naming Saturday December 16 as Wreaths Across America Day. A ceremony is schedualed for 11 a.m. at the south entrance of the Oak Hill Cemetery Dec. 11. McAlester Ammunition Plant Base Commander Colonel Joseph D. Blanding will be the speaker. The annual ceremony is being sponsored by Masonic District No. 27 AF & AM and the Kilihoti Champter of the DAR in conjunction with Wreaths Across America. Pictured seated from left, John Browne, mayor and Herb Hinton; and standing from left, Dennis Jay Wilson, Dave Bruno, Charles Thurber, Christina Thurber, Tammy Hinton, Paul Marean and Barbara Burke, Gold Star wife.